Do you like to do crafts but want them to be easy and simple to make? If you wear earrings and like to upcycle things, I have a DIY craft project for you. I am going to show you how to make a fun pair of DIY Lego earrings from upcycled Legos. They are very light on the ears and cute and fun to wear. If you do not have any old Lego’s and still would like to make these, you can pick a small pack at a dollar store for just $1 and they will work just fine. The first thing you need to do is lay the Lego pieces on a piece of cardboard. Take the wood burner or soldering iron and melt a hole on the top at one end of each of the Lego’s. Now on that same end, melt a hole at the very end of the Lego. Take a knife (I use an X-Acto knife) and scrape off any rough edges from where you melted the holes. Just be very careful not to get your fingers. Take one of the jump rings and separate it so that it is open. Run it in one hole and out the other. Then clamp it closed with the pliers. Now take another jump ring and run it through the one you just put on the Lego. Add the earring hook to that jump ring (make sure you have it so that the Lego will face the right way when wearing them) pinch that ring closed with the pliers. There you go! Easy right!? 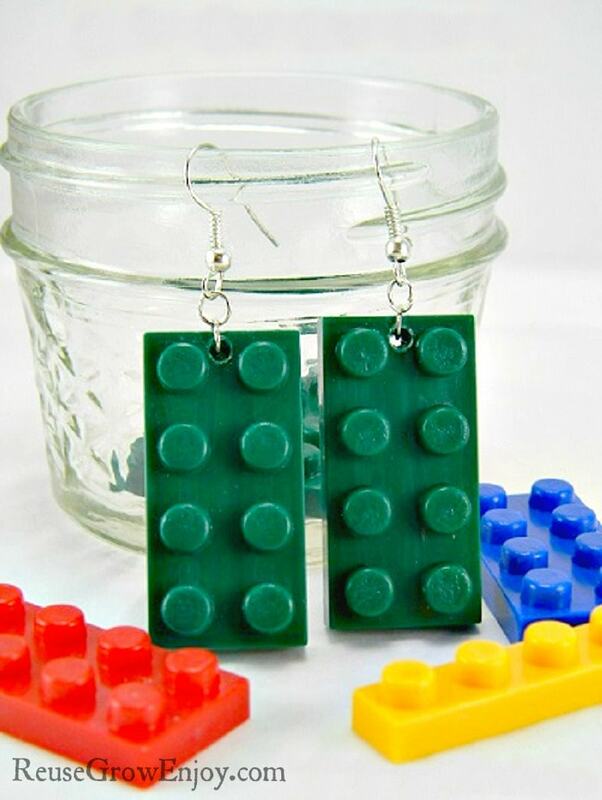 You now have a new pair of DIY earrings made from repurposed Lego’s.